While Startup Weekend was rapidly expanding into new cities and establishing startup communities, community influencers in Kosovo were discussing ways to strengthen the startup ecosystem and make it easier for entrepreneurs to build their companies here. An unemployment rate of over 40%, a young population aged 15 – 32, political challenges and many market needs, are some lines that could be added to a bullet list describing some parts of the country, especially on the entrepreneurial aspect. For some reason I consider this more as a heaven for entrepreneurs, based on the fact that an entrepreneur sees an opportunity which others do not fully recognize. “Experts” tend to divert or discourage them by slapping them with the common lines like “It will not work” or “you will never make it”, but this is something that a true entrepreneur from here will face and make him try harder. 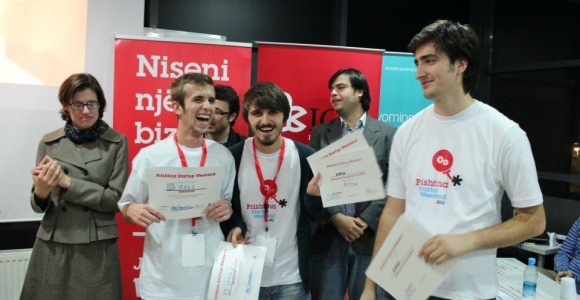 Until December 2011, Prishtina – the capital of Kosovo – was lacking an arena where entrepreneurs could find openness, collaboration, and education; a place where ideas are welcome and where you get to meet with complete strangers with passion and vision, and start a company in 54 hours. That’s something what Startup Weekend, has brought to Prishtina. It is a start and with more than 60 participants, the Prishtina Startup Weekend has achieved to make the first important step towards building the entrepreneurial ecosystem in the country. With 9 teams formed during the weekend and with mentorship from local and international experts, participants had the opportunity to test out their ideas, work on developing products, contact clients and be ready for the next step after 54 hours. Even now, while I’m writing those lines, participants are working on ideas like elexoj, sudobase, hallakate, digitalnomadpack, etc and in fact they are influencing their friends and telling them about their life experience, thus making us even more confident that the next event will be a bigger success and the startups of Kosovo will pop up one after another. For the first time, startups in Kosovo will have bigger chances because the Ministry of Foreign Affairs of Norway is investing in a project in Kosovo called “Innovation Centre Kosovo” – a business incubator, training facility and portal for existing and new companies to target the international market – and thus offering the possibility for creating more jobs, generating revenue, winning awards, solving problems and in fact creating value for themselves, the community and the economy of the country. While the Prishtina Startup Weekend and the Innovation Centre Kosovo are considered as the first infrastructural element for the ecosystem, the country now needs to work on establishing the culture of investors – business angels and accelerator programs, to fasten the process of startups forming and amplifying the early momentum of entrepreneurs.